Lock down desktops the way you need, reduce support and security issues. Block unwanted applications and websites, apply desktop and system restrictions. Deskman runs on your own computers, not in the cloud. We do not collect data. Sync restrictions over your network, protect workstations from any point. Restrict access to any desktop component. 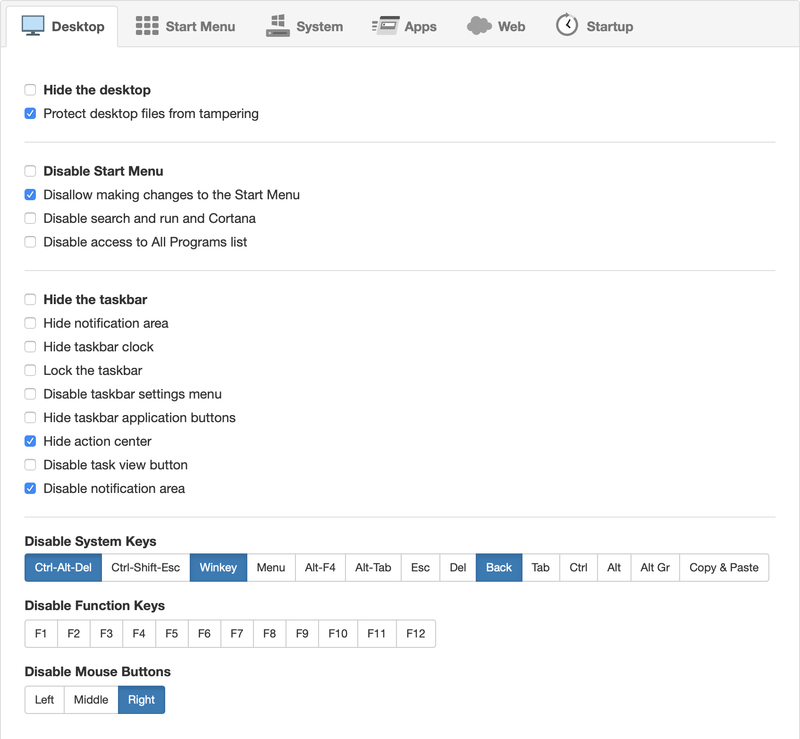 Disable system keys and mouse buttons. Build your own Start Menu, with only a few applications and commands. Easy to setup. Deskman is easy to use and fast to deploy. Everything included, no special requirements. Start maintenance mode when needed. Keep track of changes and allow guest access. Deskman includes a detailed activity log for auditing, no automatic updates and is 100% private. Made with passion by the same team since 2000 and trusted by organizations all over the world. Disable access to settings, web browser options, explorer menus, USB drives and system tools. Block applications, stop software installation and filter websites easily. Network sync, allowing automatic configuration of multiple installations. Manage all your copies easily. Deskman requires Windows 7, or better, and a web browser, with low memory and cpu usage. Deskman needs a web browser for configuration, but it's not in the cloud and internet access is optional. 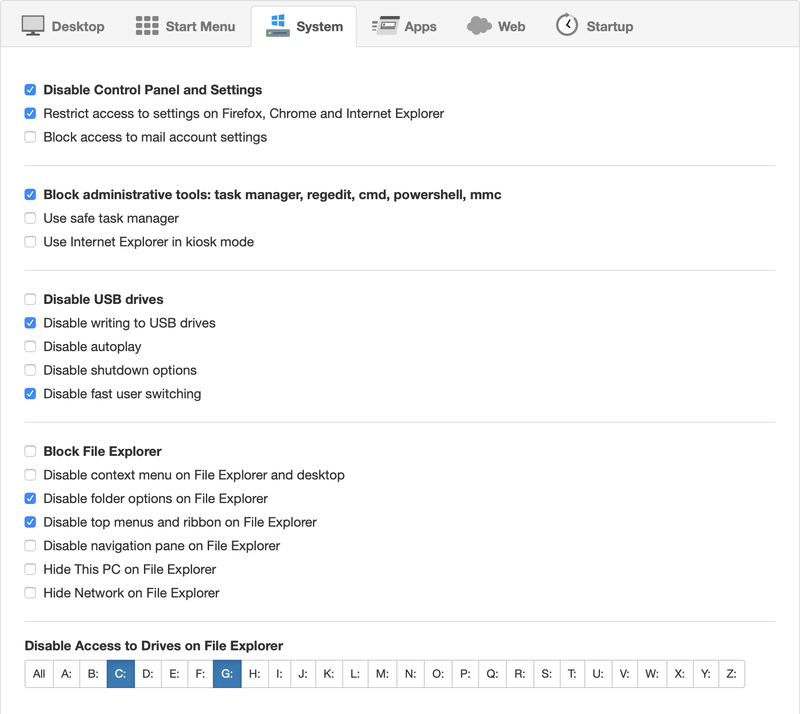 Deskman is able to block access to programs, websites, desktop components and system settings. Licenses do not expire and include 1 month of tech support. Maintenance subscription available. Deskman is available in English y también en español. Support in English and Spanish. Deskman is a program that helps you restrict access to Windows, blocking applications, filtering websites and protecting workstations from tampering. Designed to greatly simplify the security configuration of workstations. Deskman is used by companies and organizations all over the world, such as J&J, SIEMENS, Novartis, York Police, Hovione, McLennan County, KPMG, BMS, Seagate, Penn State and many others. Deskman is free to try for 30 days, full version, no questions asked.